one of Sydney's premier waterways. We are a self drive boat hire located in Sydney. No license or previous boating experience is required to drive any of our boats. However, Valid Photo ID is needed to fill in our hire forms. Safety equipment including life jackets, are provided for all adults and kids. We provide driving instruction and a detailed map of the river with all hires. The map shows fishing spots, beaches, rest stops, no go areas and limits, as well as safety tips and rules. All our boats are licensed for up to 4 people to fish at any one time. If you plan to have more than 4 people fishing, then a fishing license will need to be purchased for each extra adult. Fishing licenses can be purchased here at the marina office. Children do not require a fishing license in NSW. We also sell tackle, fishing rods and reels and frozen bait. If you do not want to purchase a new fishing rod we also have fishing rods for hire ($10 hire fee). To book a boat you will need to call us on 9528 3033, as we don't do online bookings at this time. Please read the following information below, important information is given about each type of boat. Hires that are 3 hours or less in duration are for walk-in hires only. A half day is split into morning and afternoon sessions. The morning is from 8am to 12pm and the afternoon is 12:30pm to 4:30pm. A full day hire is from morning until 4:30pm. The hire boats cannot be hired past 4:30pm. Because of this and our minimum hire time, 2:00pm is the latest a boat can be hired. The Runabout Boat is great for enjoying the sunshine while cruising, fishing along the river or anyone looking for tinny hire. It is licensed for up to 4 people to fish, and includes one tank of fuel and all safety equipment. A map of the river is provided with each hire, and indicates known fishing hot spots, waterfront parks and public toilets. Please see above for information regarding hire times under 'Booking a Boat'. 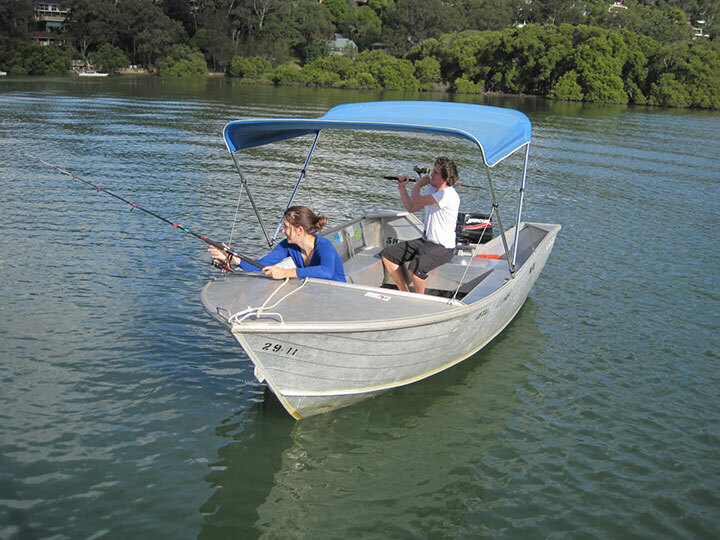 The Canopy Boat is licensed for up to 4 people to fish and includes one tank of fuel and all safety equipment. It is well suited to enjoying both fishing and the sunshine while also offering protection with its canopy. A map of the river is provided with each hire, and indicates known fishing hot spots, waterfront parks and public toilets. The Cruise About is a great choice for enjoying the river in comfort and style! It is licensed for up to 4 people to fish, and includes one tank of fuel and all safety equipment in the hire price. This tinny has extra comfort with forward steering, key start engine, upholstered seating and carpeted floors. A map of the river is provided with each hire, and indicates known fishing hot spots, waterfront parks and public toilets. The Luxury Sunshine Pontoon is a great way for families and friends to enjoy a picnic or to go fishing along the Georges River. It is licensed for up to 4 people to fish and includes one tank of fuel and all safety equipment. The Sunshine Pontoon is fully upholstered and carpeted throughout. A map of the river is provided with each hire, and indicates known fishing hot spots, waterfront parks and public toilets. The 10 Person BBQ Pontoon is a great way for families and friends to enjoy a BBQ lunch and fish along the Georges River. It is licensed for up to 4 people to fish and includes one tank of fuel and all safety equipment. The 10 Person BBQ party boat is fully upholstered, carpeted throughout, and also includes a sink, large table and a gas BBQ hotplate. A map of the river is provided with each hire, and indicates known fishing hot spots, waterfront parks and public toilets. The 12 Person BBQ Pontoon is a great way for families and friends to enjoy a BBQ lunch and fish along the Georges River. It is licensed for up to 4 people to fish and includes one tank of fuel and all safety equipment. We have four 12 Person BBQ party boats and each pontoon has a slightly different configuration, however all pontoons include a toilet, sink, large table, radio/CD player and a gas BBQ hotplate. A map of the river is provided with each hire, and indicates known fishing hot spots, waterfront parks and public toilets. If you are unsure where to explore for the day please ask our experienced staff for a recommendation.